In so many ways we have come to judge the quality of life by what we possess and not by what we share. Yet the truth is that our children and young people, just like our grannies and grandpas, are part of a family life which we neglect to our peril. Of course, there are any number of reasons for change—not least in such a mobile society. But perhaps the time has come to reassess our relationships one with another—perhaps a little less selfishly? The real treasures of life are those who are our dear ones and those who love us and care for us. The greatest appreciation and the most special of gifts has to be in the time we spend with them. Yes, this will prove difficult and impossible for very many in a traumatised and troubled society. But there is an alternative—one where people can feel safe, loved, protected and treasured. We might strain to bring to mind where that community exists. But, quite simply, this is precisely what the Christian Church and community is called to be. That might prove quite a challenge, but it is a wonderful endeavour in Jesus’ name. Fr Mark Soady, who is currently Chaplain to the University of Wales, Newport, and priest-in-charge of All Saints church in Brynglas, is to leave Newport at the end of the year to become Vicar of Abergavenny and Rector of Llanwenerth. The post became vacant following Canon Jeremy Winston’s appointment as Dean of Newport Cathedral. Fr Jeremy’s last service as Vicar of Abergavenny will be Evensong on Sunday 4th September, at 6pm, to which all are welcome. Fr Mark says: “I’m privileged to have been appointed to be Vicar of the Abergavenny Group of parishes. Fr Jeremy will not be an easy act to follow, but I believe my experience at St Mary’s, Tenby, and at Newport Cathedral has given me the grounding I need to build on his work. Dr Peter Noyes, Vice Chancellor of the University of Wales, Newport, said:“On behalf of the entire University family, I would like to thank Fr Mark for his tireless work over the last three years. In everything he has done, from the joyous occasions to the support he has given to individual students and members of staff at difficult times, Mark has been a rock for Newport’s University. Fr Mark started his ordained ministry in Tenby. He was appointed to the staff of Newport Cathedral in 2003 and has played a major part in the Cathedral’s Restoration Appeal. He was appointed the first Chaplain to the University of Wales, Newport, three years ago, serving also as priest-in-charge of All Saints in Brynglas. Before entering the ordained ministry he was a psychiatric nurse and he also served as personal assistant to the late Lord (Roy) Jenkins of Hillhead, and worked on democratisation programmes in Africa, Central & Eastern Europe. It is expected that Fr Mark’s induction as Vicar of Abergavenny will be in the New Year. 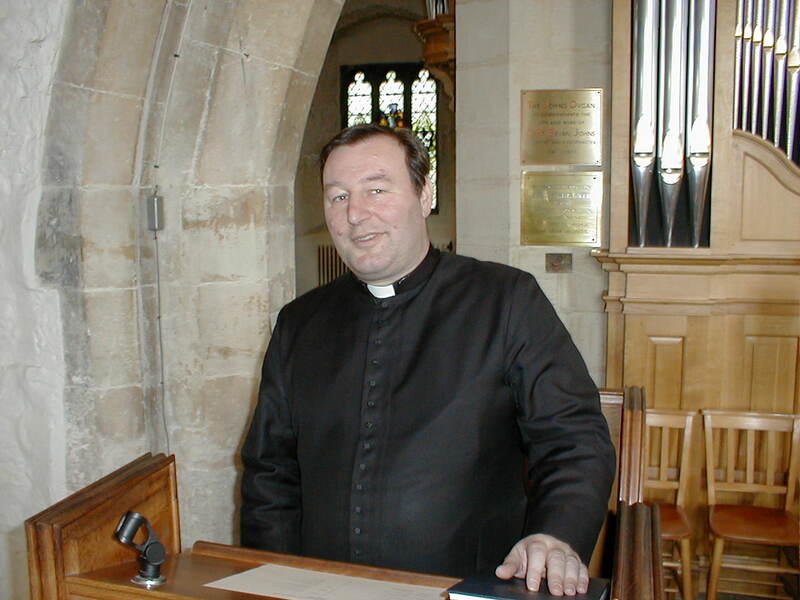 Canon Jeremy Winston will be installed as Dean of Newport Cathedral on 10 September 2011. The Installation at Newport Cathedral will be beamed ‘live’ to the Priory Centre in Abergavenny. Despite the depressing picture of buildings set alight recently by wayward young people in some of our large towns and cities the past week has seen the ‘A’ Level results celebrating the achievements and aspirations of a generation of focussed and intelligent youngsters. We may continue to be appalled by the wanton idiocy of rioters who, in the mind of some of us, receive a disproportionate amount of publicity over and against the remarkable dedication of young people working in the voluntary sector, to say nothing of those developing intellectual and practical skills for the benefit of humanity. Sad to say, only a few of these truly wonderful examples come to the attention of the world at large. Yet the good news is that in every century humanity has the capacity of developing far more good than bad, and far more creativity than destruction. In literature, in art and music each new generation brings us insights, fascination and wonder. But that is also true in areas of science and discovery delivering advancements in medicine and technology on what amounts to a daily basis. Alongside these developments there are depressing scenes—some of which threaten to drive us back into a type of ‘dark ages’ of constant warfare and destruction. But we cannot allow such a scenario to raise its ugly head, and the forces of good and generosity have to stand firm. Neither will it do to describe destructive activity as youthful exuberance—the burning down of people’s homes and businesses is shameful and unacceptable in any society. Nor should we assume that our political leaders possess, by right, some moral high ground. Surely, society needs constantly to look at the ways in which it cares for the needy and provides for our young people, to say nothing of respecting and loving a generation of older and older people. There are no easy solutions. But the endeavour of human beings, whether young or not-so-young, serves to strengthen our communities and enrich our humanity. Christians look to the founder of their faith and the Saviour of the world who not only called us to be salt to the world, and to be light in the face of gloom and darkness, but who showed over and over again that grabbing and hoarding reduces us to a depraved and ugly state of sub-humanity. But when we embrace his example of sacrifice and love we enrich the course of humanity amazingly—going the extra mile, embracing the old, the young, the sick and the poor, giving one’s shirt as well as one’s coat. This is what human beings are called to be. This, too, is what our young focussed people show over and over again that they are capable of doing. In their successes we rejoice. But may they continue that success not by greed and possession, but by dedication, fulfilment and sharing. That will be their real blessing—and it will turn out to be ours, as well.